Holdsworth House clinical research unit has participated in research since our Sydney practice was founded, and the semi-autonomous research unit has grown to become one of Sydney's most ambitious and comprehensive. The following types of clinical research studies are performed at Holdsworth House Medical Practice. If you are over 18 and taking only one hypertension medication, or none at all, and your blood pressure is not well controlled you may be eligible for this study. All study assessments and medication are supplied at no cost. You may be eligible for a clinical trial. Have you been vaccinated against Meningococcal Disease? 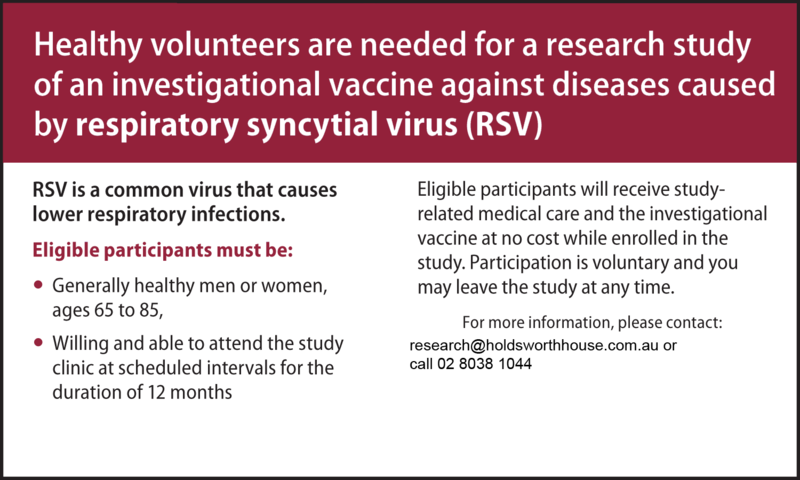 The Holdsworth House Research team are currently recruiting for a study using licensed vaccines for meningococcal disease in the 18 to 50 years old age group. If you have never had the meningococcal vaccines, weigh over 50kg and have a BMI under 32 you may be eligible. There will be 4 or 5 visits over an up to 8 month period and participants will receive reasonable reimbursement for travel expenses. For any questions or information that is not provided below please contact our friendly research team. What are the risks involved with clinical research? Generally our research unit only take part in later phase studies where the drug or treatment has already been extensively tested in both laboratories and humans for side effects. Before consenting to any clinical trial, potential participants are given very detailed information about what the study will involve and the possible risks and side effects. This information is approved by an independent ethics committee who ensure that the patient’s safety and care is considered above all study activities. During a study participants see one of our Doctors at every visit and are monitored carefully for any ill-effects or reactions to the study treatment. Sponsors respect the privacy of study participants and safeguard the confidentiality of their medical information in accordance with all applicable laws and regulations. While access to confidential medical records may at times be necessary to verify clinical information, no information that identifies individual participants is retained by Sponsors. Can I change my mind after agreeing to participate in a study? Participation in a clinical trial is completely voluntary and participants may withdraw from a study at any time. Does it cost anything to participate in a study? In most cases, there is no cost to you to participate in a clinical trial. Your medication, treatment and medical appointments relating to the study will be free of charge. However, you will be required to attend the clinic at regular intervals and in certain instances there may be compensation available for time and travel expenses. We welcome enquiries from potential sponsors at any time. Please contact us for further information. For more information on current or upcoming studies, get in touch with our research team.